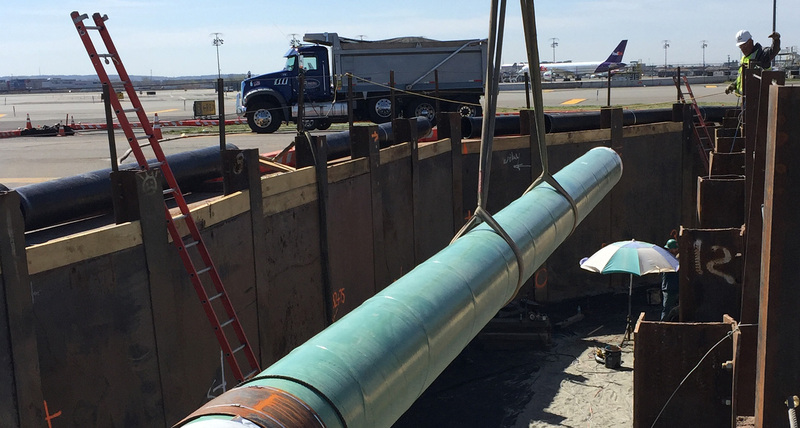 Conti recently achieved a major safety milestone on its $62M construction project to relocate and modify the Jet-A fuel lines that run under New Jersey’s Newark International Airport (EWR) in anticipation of expanding Terminal A. Working for the Port Authority of New York and New Jersey (PANYNJ), the Conti Field Office Management Team and Locals 472, 825, 475 and 469 celebrated over 100,000 man hours worked without a recordable incident. This safety achievement is significant given the dangerous nature of the project (referred to by PANYNJ as the EWR 154.183 Aviation Fuel System Project), and because it entails performing on the “air side” at one of the world’s largest and most heavily trafficked airports without any disruption to operations. The project is scheduled for completion in the spring of 2017. By providing a full circle approach to safety, with programs that include “Take 5” discussions and weekly project safety talks, collaborative discussion amongst Conti’s project team are a daily occurrence with each team member drawing on their own past experiences. “We have a tight knit group with everyone watching each other’s back,” said Conti Project Manager Keith Abt, PE.